HVAC stands for heating, ventilation, and air conditioning. It is the main technology which ensures acceptable air quality and thermal comfort for the indoors and vehicles. The HVAC design system is an engineering feat which utilizes core physical principles of heat transfer, thermodynamics, and fluid mechanics. HVAC is a vital components in almost all modern day structures said as residential homes, single family homes, apartments, commercial properties, and skyscrapers. 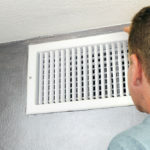 The V in HVAC (ventilation) is perhaps one of the most vital components of the HVAC system. This is because it is the defined process of ensuring the indoor air you breath is of high quality which is acceptable to breath. The ventilation process takes into account many different aspect of air such as temperature control, oxygen replenishment, and the transfer of unpleasant odors, moisture, dirt and debris, airborne bacteria, carbon dioxide, and other chemicals or gases in the air. Many different kinds of HVAC system’s exist. This means that for every different HVAC system there a different method of heating, ventilation, and air conditioning exists. One method which the HVAC system uses to distribute heat through the ductwork systems of supply and return is the water or steam distribution method. In this case piping transports heat to the individual rooms. Today, hot water boiler systems use a pump called a “circulator” which moves hot water through the distribution system. Older systems used to rely on gravity. Another, older, more neutral system existed for ventilation. This system was called the “natural ventilation” system. This system ventilates a building with outside air without the use of any mechanical systems. Instead, this system relies on operable windows, louvers, or trickle vents. Warm air rises and flows outside of high building openings while cool air falls and is drawn into the building. Here at Organic Air Duct Cleaning we know how demanding running a business can be. That is why we offer services that will facilitate the productivity of our local community and its businesses. The solutions we offer may improve you and your employees health and productivity as well as the efficiency of your HVAC systems. This will only go to save you sick days and money in the long run. As part of our commitment to help keep our community safe, Organic Air Duct Cleaning only uses cleaning products that are 100 percent natural and safe to breath. Unlike some other cleaning companies, we promise to clean using non-toxic, organic certified products. We do this so that you can have peace of mind and know that you and your employees won’t have to worry about the air you breath. The HVAC (heating, ventilation, and air conditioning) system is an important technology that came about with the industrial revolution. It is a system which not only ensures and provides for our comfort, but also our safety. We are now more than ever protected from harsh weather patterns and that is in part due to the incredible invention of the HVAC system. In order for your HVAC system to run at full efficiency and capacity, while doing its job in keeping you and your employees safe, the HVAC system must be properly maintained and cleaned. That is why we offer our premier HVAC cleaning services which only utilize certified natural, toxic free, and organic cleaning products that are safe to breath.